Torque density is the ratio of the rated torque of a transmission to its weight. It is a critical parameter in robot arm design since the weight of the robot arm actuators become part of a distributed load that needs to be moved and positioned along with the primary robot payload. The two types cover different operating regions. 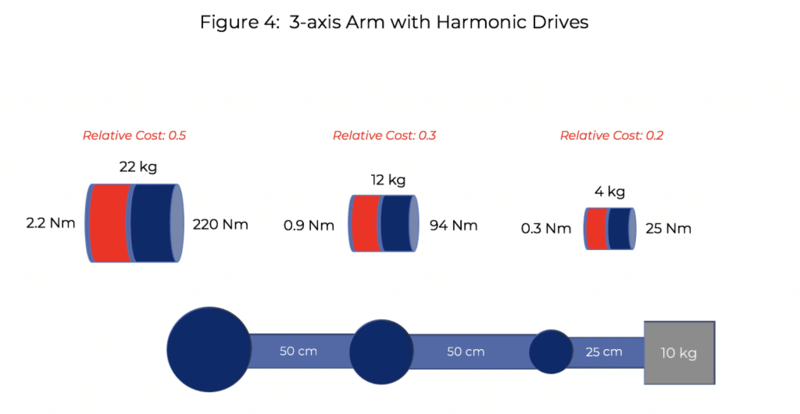 Harmonic drives tend to be used in lighter weight robots or in the higher axes of heavier robots, while cycloidal-type drives are used with higher payload robots and/or in the lower axes of robots. Cycloidal-type drives on the market are not true cycloidals: generally, they employ a planetary input stage in order to achieve acceptable gear ratios. 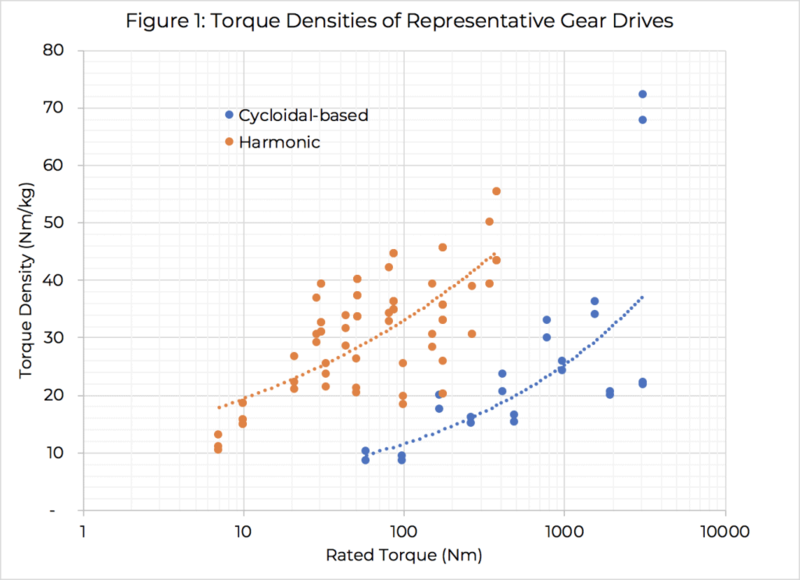 The weight penalty imposed by the additional stage of gearing in cycloidal-type transmissions can be seen in Figure 2, where the torque ranges overlap. Although harmonic drives are touted to require only three main components – circular spline, flexspline, and wave generator – these components are heavy, employing 439 or 304L stainless steel for most applications, with a density of around 8000 kg per cubic meter. 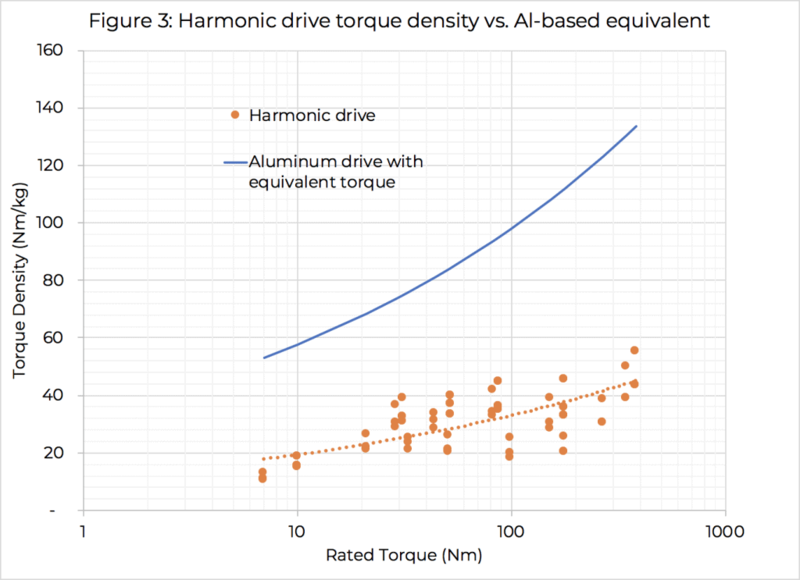 While some research has been conducted into manufacturing harmonic drives from less dense materials such as bulk metal glasses (BMGs) , these allow only moderate improvements in weight and have yet to be widely commercialized in any case. An aluminum-based design could yield up to a 3-fold improvement in weight, but due to the complex nature of the design, this possibility is not available for harmonic drives. Figure 3 illustrates the dramatic impact that a lower density material could have on torque density. Actuators become inherently lighter: Aluminum has a density over 60% lower than that of steel. Actuator costs are lower: Aluminum is inherently easier to machine, which results in much lower manufacturing costs. Assuming that cost savings are passed on to customers, a transmission fabricated from aluminum could cost up to 50% less than an equivalent harmonic drive, which must be precision machined out of steel. The effect of lower actuator weight is compounded in a multi-axis robot, since each lower axis actuator must move the weight of all of the actuators downstream from it, in addition to the payload. This is illustrated in Figures 4 and 5 below . Since the final actuator weight is reduced from 4 to under 3 kg in the example, the second axis actuator needs to provide less output torque – 10% less in this example. Thus, the second axis actuator benefits not only from a lower density material but also from a relaxed torque requirement. The result is even more dramatic for the first axis actuator, which now can provide 20% less torque. The benefit would continue to compound if additional axes were added. 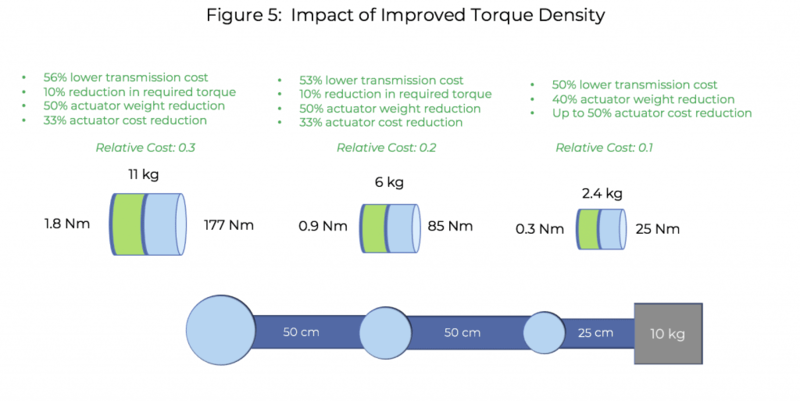 The figures below show that the use of lighter weight materials in robotic transmissions have the potential to lower actuator costs by over 30% – based on a simple analysis of static moments alone. In succeeding articles, we will show how Motus technology provides not only this benefit but also exceeds harmonic drive performance in the area of torsional stiffness. As will be seen, this could provide many multiples more system cost savings. See, e.g., D.C. Hofmann et al., “Castable Bulk Metallic Glass Strain Wave Gears: Towards Decreasing the Cost of High-Performance Robotics,” Nature Scientific Reports, November 24, 2016. 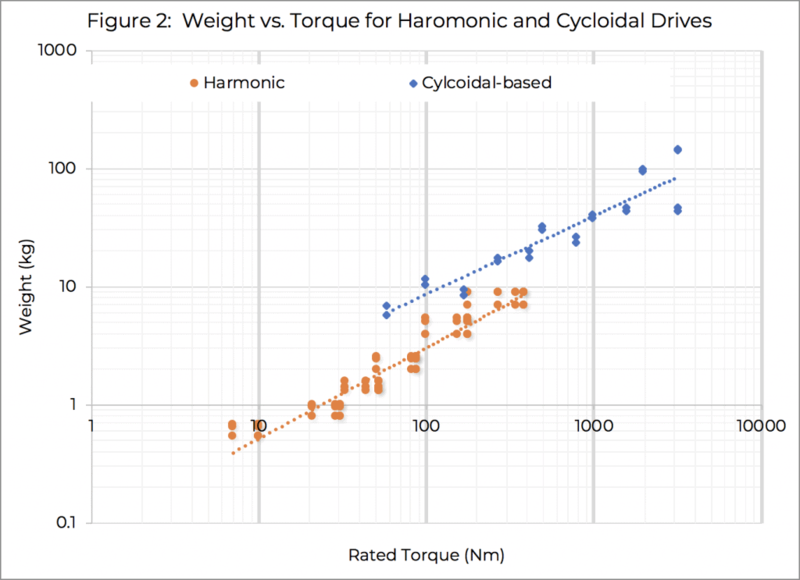 Assumptions: Torque-weight characteristics as described above; relative weight of motor is 2x associated harmonic drive; relative cost of motor equal to relative cost of associated harmonic drive; 100:1 gear ratio; 0.4 price sensitivity to rated torque (i.e. relative price for motor or transmission increases 0.4% for each 1% increase in price).